We've covered the A to Z of pub snacks and brunch. Now it's time to tackle sandwiches. 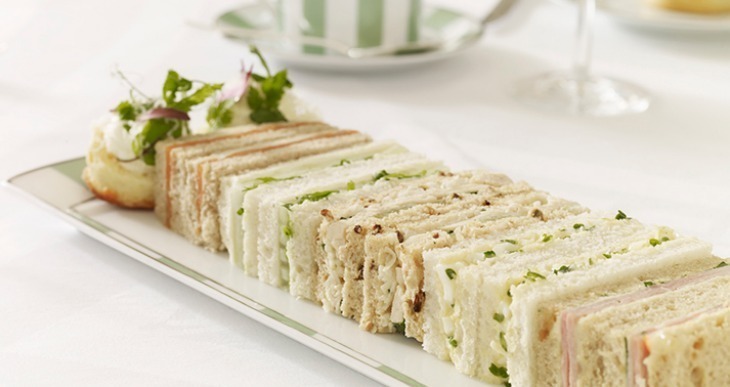 Afternoon tea is everywhere in London, but the sandwiches often play second fiddle to the cakes. We prefer them traditional; cucumber should be salted with plenty of butter; salmon should be smoked, laid upon snowy cream cheese; bread must be fluffy fresh (check out our guide to doing afternoon tea, properly). London has a long history with bagels, from the bakeries of Golders Green to the 24-hour queue at Brick Lane's Beigel Bake. They come stuffed with salt beef, smoked salmon, eggs and avocado; we even succumbed to the latest trend to wash up from across the Atlantic: rainbow bagels. Although the less said about those, the better. Afternoon tea at Claridge's. Look how neat the sandwiches are! You'd be hard pushed to find a regular cheese and pickle in London, but everything else is fair game, from slappy slices draped over burgers and cheesesteaks, to stringy mushroom melts. 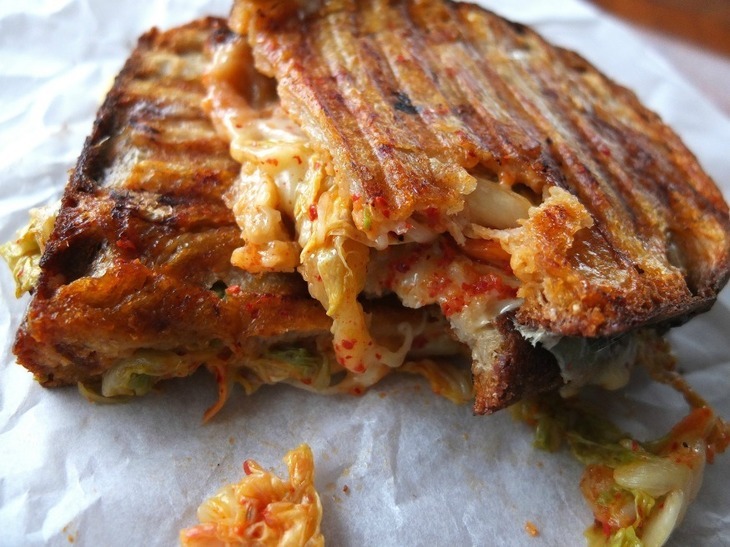 Cheese toastie fever has also hit an all time high, but you're to have to wait until we reach T for those. In the US there are numerous 'made to order' sandwich shops which are consistently high quality. In London we suffer the scourge of the glass counter populated by silver trays of Things Mixed with Mayonnaise, many of them sporting a crust. This particular breed of sandwich shop just won’t die out. Wan baguette dribbled with chicken tikka, anyone? Thought not. 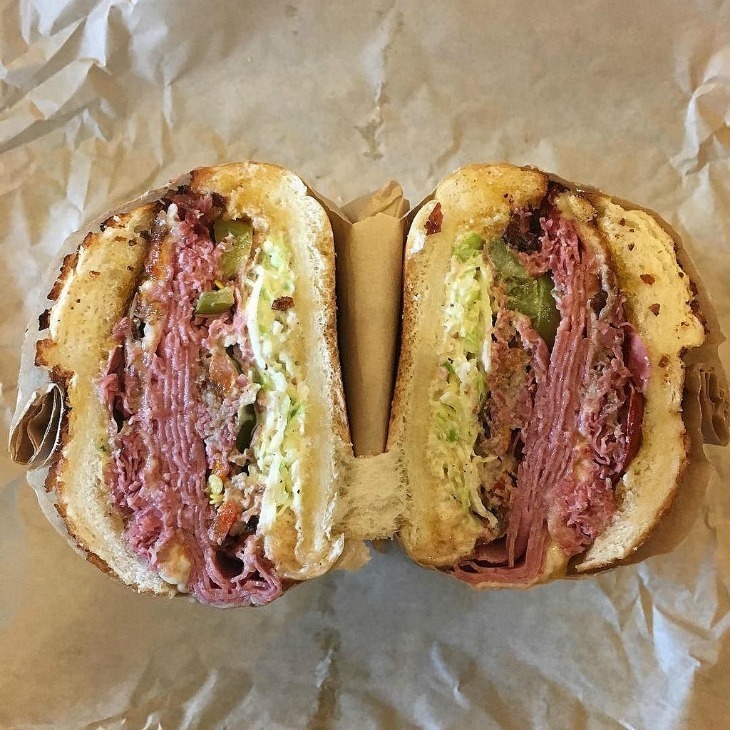 A classic deli sandwich. Photo: Matt Biddulph. Sorry cheese, but eggs may have knocked you off your perch. Breakfast eggy baps come layered with sausage, an homage to the McDonald's classic; frilly fried eggs are greasy spoon staples and the egg mayo well, it’s timeless. Nursery food level 10. Here is the age of the fried sandwich. Fried chicken in particular, is everywhere, its crunchy shell shattering beneath a slightly sweet brioche bun. Add 'Asian style slaw' for extra trend points. 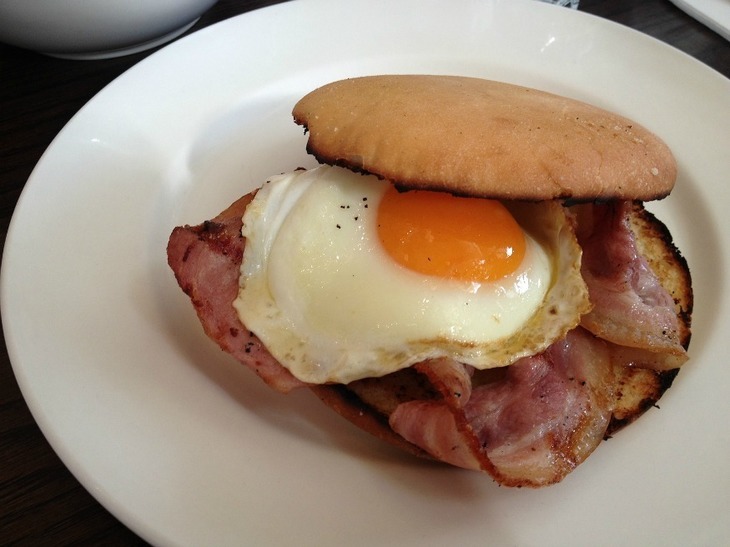 A classic egg bap. Photo: Yann. At some point, sandwiches got gourmet. There was a time when finding a sandwich in London meant only going to Pret or worse, the supermarket. They moved from single filling, functional belly fillers to exciting, multi-layered meals. The sandwich is no longer just a snack. Is it a sandwich? Of course — it's stuff in a bun. Like burgers but… longer. 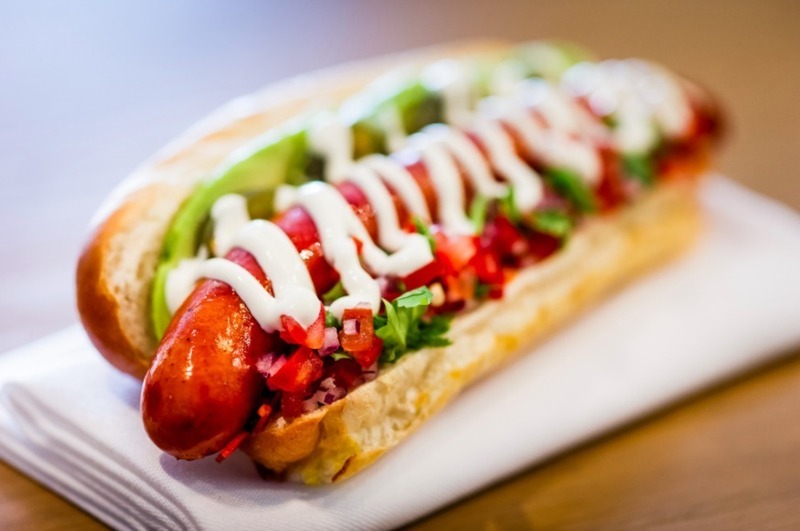 While the burger trend shows no sign of going away however, the hot dog might be dead. We've gone from pelting them with every topping imaginable to not caring if they end their sad lives in a jar of murky brine. What dog? Bubbledogs serves a range of hot dogs with champagne. Ice cream sandwiches ruled the summer of 2016 with their squidgy cookies and scooped fillings. Queen of the scene was Blu Top, their choc chip dotted version all over Instagram like a beautiful chocolate rash. Japanese sandwiches can generally be found in Japanese patisserie shops like the fantastic W A Café in Ealing. They're always immaculately presented, cubed just so, crustless and uniform alongside the strawberry sponges and matcha swirls. A Japanese tonkatsu sandwich. Photo: Lucius Kwok. There was a time in 2015 when everything came with gochujang mayo. It still tastes brilliant. There’s a fair bit of 'Korean hot sauce' going on too, particularly when it comes to fried chicken. What about some other Korean influences though, huh? Bulgogi sandwich? Is London over the lobster roll? Not likely. The top two in town still come Maine vs. Connecticut-style (Burger & Lobster vs. Hawksmoor). The former served cold with mayonnaise in a toasted bun, the latter warm with butter. 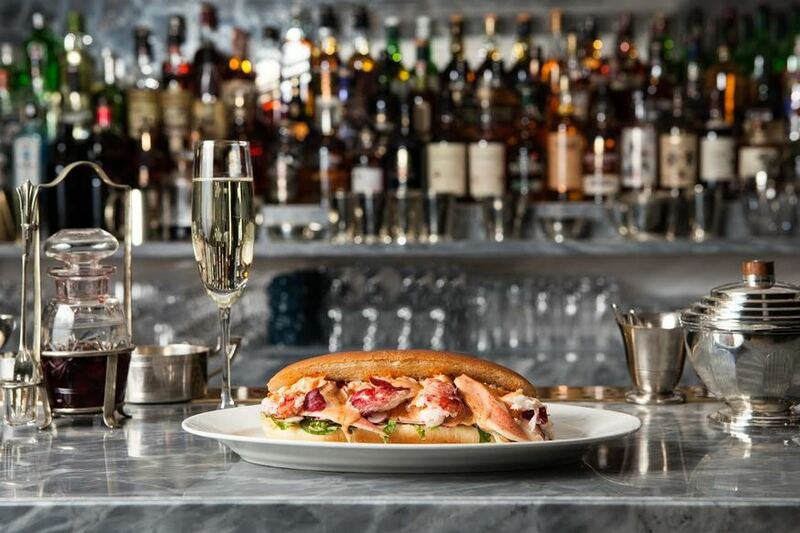 The lobster roll at Hawksmoor: a London classic. We love London's street food scene but it does tend to be dominated by 'meat in a bun' options. Come on guys, there are other ways to do this sandwich thing. We need some fresh blood. Max's Sandwich Shop is making the most exciting sandwiches in London right now, blazing a trail with the Ham Egg and Chips (no it isn't just ham, egg and chips) and Murdering the Caesar, a riff on the original salad that makes the Pret version look like the poorest imitation; it's someone singing a Bowie song into their hairbrush. Murdering the Caesar at Max's sandwich shop. The Scandinavian influence. Open sandwiches can be found in almost every Scandi deli in London, where people queue for hours for coffee and cinnamon buns. The thing is that open sandwiches are, well, open. The ingredients suffer, and no one likes to see a withering prawn. The life of the pre-packaged sandwich was revived by the arrival of Pret, EAT and the other, even more dismal chains. At Christmas they really rip off the gloves, competing to create the best arrangement of turkey, bacon and cranberry sauce. Pret always wins. 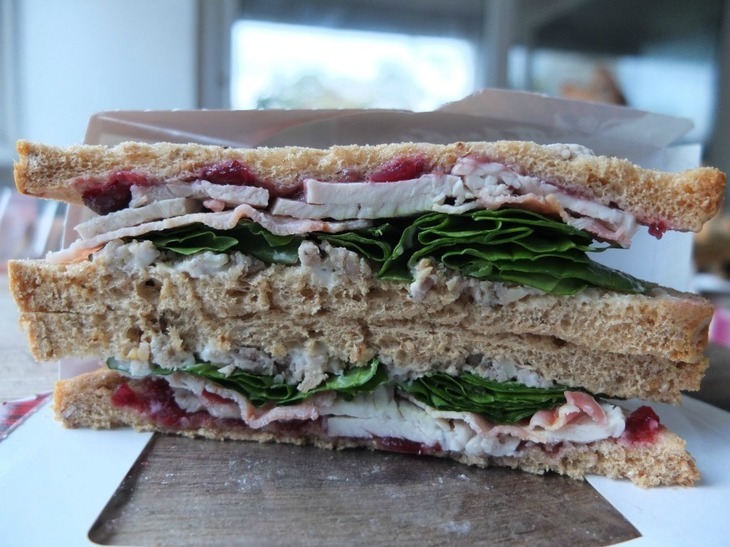 It's nearly Christmas sandwich time. See above. 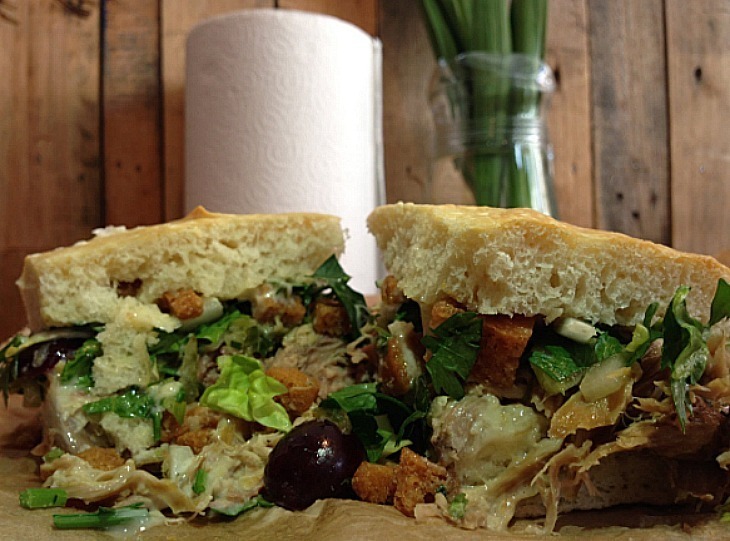 London's sandwiches are on the up. The best sandwiches are always riffs on a classic. Think about it. 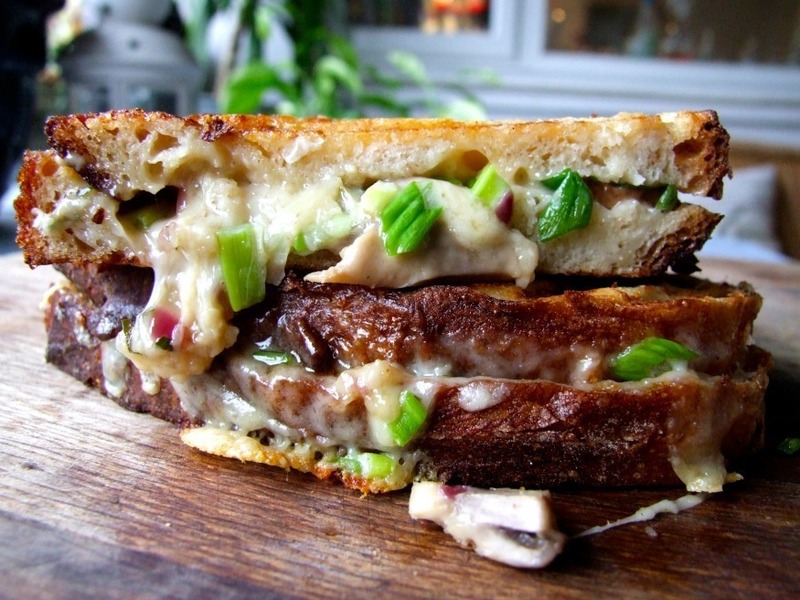 A toastie from The Cheese Truck. Very 2016. These bleached white puffs took Londoners in their soft, gaping mouths and gripped. People will still queue for hours in the freezing cold to get their hands on one. The toastie was once something made with two pieces of crappy white bread, some waxy cheddar and, if you were lucky, an old Breville sandwich maker. People experimented, sure, but they experimented by putting baked beans or tomato inside, giving themselves third degree burns and then never deviating from the basic cheese recipe again. 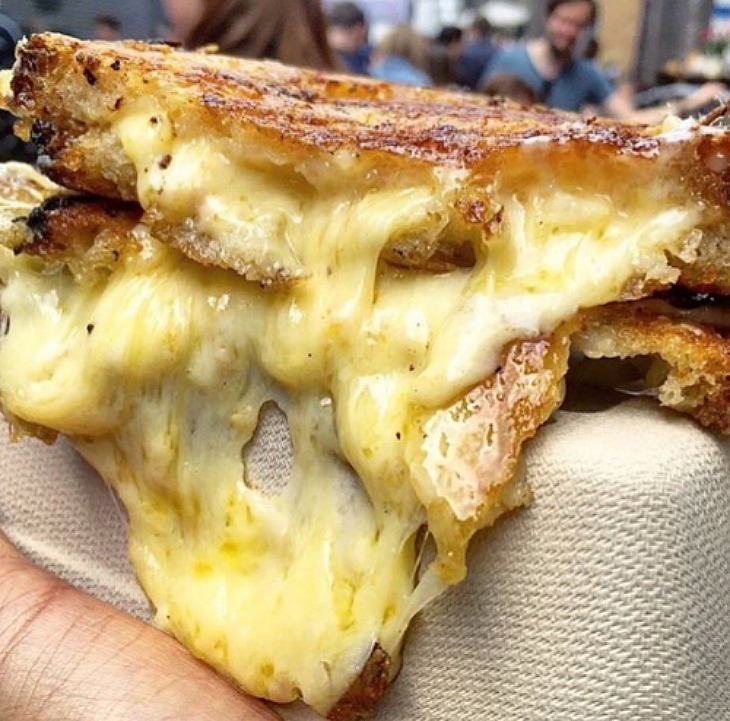 Now, the posh toastie is everywhere, with ever increasing amounts of cheese inside; pull apart a modern London toastie (or, as we must now call them, 'grilled cheese') to release a yellow waterfall. Is anyone else over too-chewy sourdough? A sandwich needs a soft, fresh bread that yields sufficiently for you to put the darn thing into your mouth. Too many times have we been unable to chew for fear of the crust doing an Edward Scissorhands on our mouths. There are many banh mi in London but few are good. 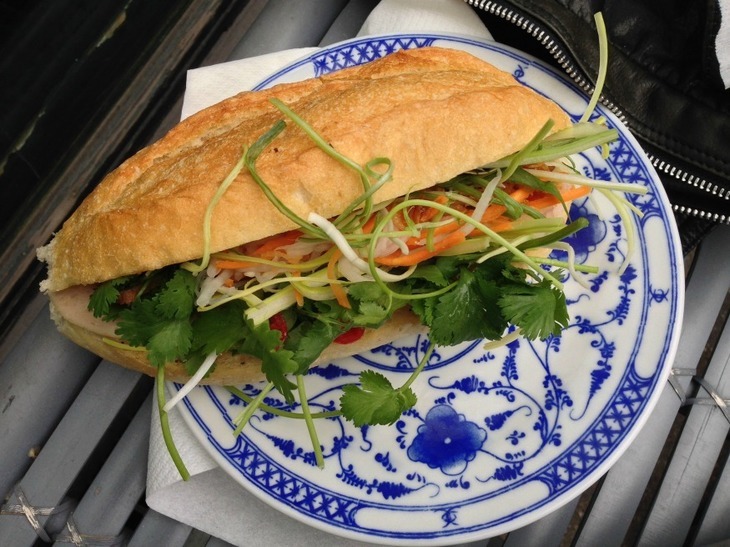 The best we’ve had are made at Banh Mi Hoi An in Hackney, the worst at Aobaba in Elephant. This is a trend that needs reviving, we say, due to the quantity of unfinished business. There is a trend for making sandwiches which are too large to eat. Eating lunch should not require the unhinging of jaws. 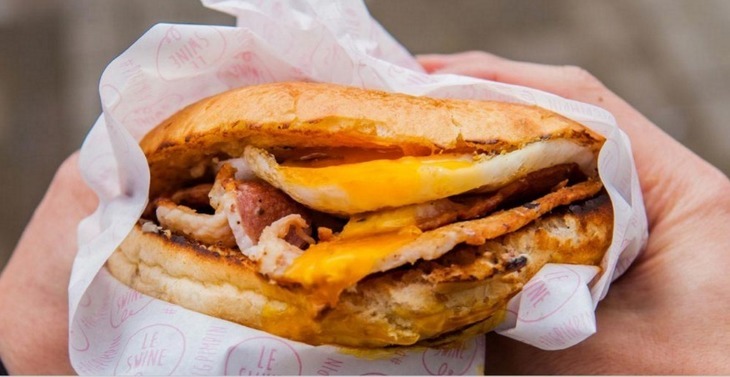 Bacon and egg in a bun from Le Swine. A classic drippy egg situation. No drippy egg yolks running down crusts = nothing to put on Instagram. Because carbs at lunch means it's nap time by three.